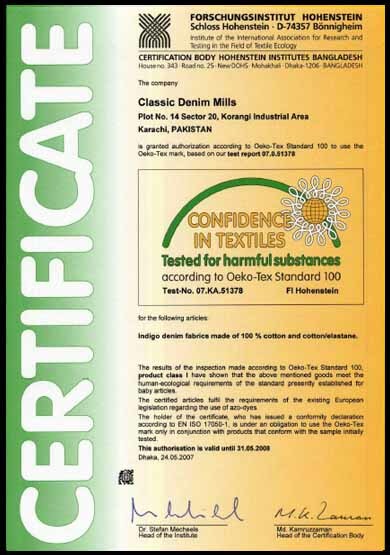 In-house R & D unit of Classic Denim Mills has continuous recognition since 2003 by Department of Scientific & Industrial Research. R & D efforts of Century aims towards, improvement in productivity and quality of Denim manufacture, create new materials, style and finishes to meet the requirement of domestic and global consumers; Process modification or chemical substitution to reduce cost of manufacture, minimize pollution and to conserve energy. Classic Denim Mills has lived up to its name by completing a century of its existence. Over the years, it has grown in terms of infrastructure and capacity to deal with the challenges of new millennium. Enriched with the experienced manpower, modern machines and sound financial health, it has made an indelible mark of excellence in Denim Business. Classic has been playing an unique role with its commitment to highest level of quality standards and it believes in rededicating itself to the same commitment in the years to come. The talent for discovering the unique and marketable characteristics of a product.